With the Pacific at her feet and mountains as a backdrop, a holiday in Vancouver offers not only beautiful views but also a variety of activities and attractions to tempt all tastes. The city has a strong culture, the cuisine is world-class, and the nightlife is energetic and diverse. There is an old quarter to stroll through, Chinatown to explore, art studios and markets to browse on Granville Island, trails to follow through Stanley Park and so much more to enjoy on a Vancouver vacation. Film buffs will delight in the strength of the entertainment industry in Vancouver, which is affectionately dubbed 'Hollywood North', and is second only to Los Angeles in television production. Sailing, skiing and hiking will keep active visitors fully occupied, and the many quality museums will keep culture vultures happy. Vancouver's weather is unpredictable, but by Canadian standards it is mild. Generally speaking the best time to travel to Vancouver is between May and September, when you are likely to catch the most sunshine. In winter, between December and February, the city is usually snow-free, but the mountain resorts just outside the city get plenty of snow; the best time to ski in Vancouver is during February. Read more on Vancouver's Climate and Weather. -Wander the eclectic, trendy Commercial Drive in search of treasures. 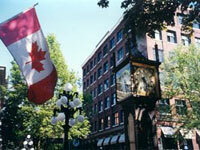 -Enjoy the Victorian architecture and cobbled streets of historic Gastown. -Marvel at the extensive collection of the Vancouver Art Gallery. -Admire sweeping views of the beautiful city from the Vancouver Lookout. -Explore Vancouver's vibrant Chinatown, a bustling, colourful commercial district. -Shop and eat your way through Granville Island, a shopping and entertainment hub. -Picnic in the lush gardens of Queen Elizabeth Park and the enormous Stanley Park. -Learn about the fascinating First Nations of British Columbia in the Museum of Anthropology. There are myriad attractions on Vancouver's doorstep, a vast playground for nature lovers and active outdoor types. The San Juan Islands are a boating and sailing paradise; the Coquihalla Provincial Park is home to the Othello Tunnels, a unique hiking experience; the picturesque Gulf Islands, in the Strait of Georgia, beckon visitors of all kinds; and just beyond the city ski slopes can be enjoyed on Grouse Mountain. Vancouver International Airport, the second busiest in Canada, is situated eight miles (13km) south of the city centre. The airport is well-connected to major cities around the world. Get more information on Airports in Vancouver. -Vancouver has regularly earned its place on lists as one of the top three cities in the world to live in. -The West End neighbourhood is home to the largest gay community in the West. -With the right weather and lots of energy it is possible to ski, golf, hike and sail in Vancouver on the same day. Nicknamed Hollywood North for the ever-present film crews, Canada's west coast gem of Vancouver is young, thriving, and diverse. It boasts the perfect combination of wild natural beauty and all the modern conveniences. Named after Royal Navy sea captain George Vancouver who sailed into the Burrard Inlet on the British Columbian coast in 1792, Vancouver was barely even a town 100 years ago. Today, more than two million people call it home, and the shiny futuristic towers of Yaletown and the downtown core contrast dramatically with the snow-capped mountain backdrop, providing ample beauty among the bustle of Canada's third biggest city. Approximately the same size as the downtown area, the city's green heart is Canada's largest city park, Stanley Park, covering hundreds of acres filled with lush forest and crystal clear lakes. Visitors can wander the sea wall along the exterior of the park, catch a free trolley bus tour, a horse-drawn carriage ride, or visit the Vancouver Aquarium housed within the park. The city's past is preserved in historic Gastown with its cobblestone streets, steam powered clock, and quaint feel, though this is combined with expensive souvenir shops and galleries aimed at tourists. Neighbouring Chinatown, with its weekly market, Dr Sun Yat-Sen classical Chinese gardens, and restaurants adds an exotic flair. For some retail therapy or celebrity spotting, there is always the trendy Robson Street. During the winter months, snow sports are the order of the day on nearby Grouse Mountain. It's perfect for skiing and snowboarding, although the city itself gets more rain than snow. Vancouver's incredible ethnic diversity and combination of mountains, sea, and city offers visitors an endless supply of things to see and do, no matter the budget.